The beginning of this post starts high above a sea of pillow-like clouds floating above Lake Superior (one of the famous Great Lakes that straddle the Canadian and US border) – we are once again flying at 37,000 feet winging towards Toronto after receiving a surprise phone call from Ontario. Terry’s nephew Sean called inviting us out to celebrate his Mom’s birthday (a birthday of note!) with the hope that all six siblings might be present to wish her well – we are filled with excitement with this unexpected summer vacation and with the thought that we are flying clear across Canada to wish Karen a very happy birthday. She does not know that we are coming – with only four days to organize our Vancouver life, it’s been a whirlwind week, it’s hard to believe we are almost there! After a fairly smooth flight with just a few bumps along the way, we landed after 10 pm (Toronto time) into the humid air of summer in a Toronto that is experiencing weather that is reminiscent of the West Coast, the cloudy skies and rain showers reminding us of home. Luckily the weather cleared the next day for a lovely gathering of loved ones to celebrate Karen’s special day, there was a happy mix of fragrant flowers, sparkling wine and delicious food reminding us of the legendary holiday celebrations of the past when the whole family came together! Before we flew home, we were happy to find ourselves heading out on a day trip to Port Perry with Karen and Terry’s brother Garth (about 40 minutes by car from Karen’s home in Ajax) to explore the historic downtown with its many Victorian buildings painted in heritage colours of mulberry and dark teal, as well as explore the Lake Scugog waterfront. As we made our way down to the water we could see some local people fishing off the pier overlooking the same moody visage that inspired Tom Thomson (1877-1917), the Canadian landscape painter who belonged to the Group of Seven. It was quite humid and the threat of rain imminent, the already dark sky looked like it might birth a tornado, its colour deepening to smudged graphite with every passing moment – despite this threat we continued to stroll beside a lake that apparently can take anyone, anywhere in the world, admiring the tall yellow lilies as we made our way. We ended up at a local store to buy some picnic food to eat outside in a quiet green park (the Reflective Park) beside a small running creek. We found seats upon an outcropping of low rock and enjoyed our sandwiches, iced tea and crisp potato chips. Just as we were all finishing our last bites, the rain began to fall from that very full sky – perfect timing to pack up and hit the grocery store to pick up some food items for supper, there were kids to feed who had spent the day at Wonderland Park scaring themselves on rides like the Leviathan and the Behemoth!. It’s been a nice languorous string of days with movies to catch up on, crisp white wine to drink and more delicious food (enjoying Terry’s grandniece Madison’s very tasty Tex-Mex layered dip, her scrumptious birthday cake pops covered in vibrant orange and blue frosting (yum!) and a guacamole dip that we inhaled with each tortilla chip scoop). As I sit here outside at Karen’s listening to various bird species settling among the many trees, I’m appreciating the cooler air and bright sunshine – there are large dandelion puffs lazily moving through the summer breeze and my thoughts are far away from the bustle of the West Coast city I left behind a few days ago. I’m back home now and I’m startled each time I come across what once was lush green lawn now just patches of withered straw – that red sun of long ago has once again appeared against a sky bruised by the smoke from the still raging fires up country, I heard that ash is falling not far from Vancouver and I wonder if it will fall here sometime soon. The strong scent of woodsmoke has chased me from our warm apartment to the cool confines of our local library, it’s eerie to be sitting here on this padded pale green bench with the sun shining its alien auburn light through the large windows behind me onto the bare floor. It’s been days since we’ve seen blue sky and mountains, our sparkling city under siege from the worst fire season in 60 years, making me dream of soaring once again high above the smoke and ruin. 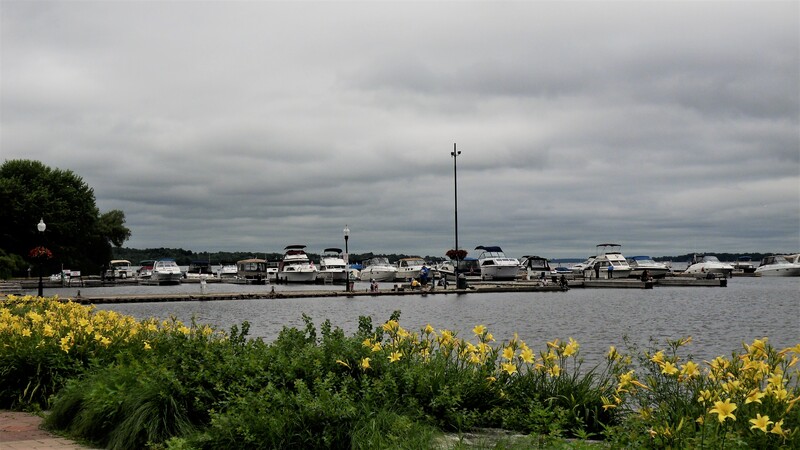 Lake Scugog underneath a stormy sky in Port Perry, Ontario looking more like Vancouver, B.C. 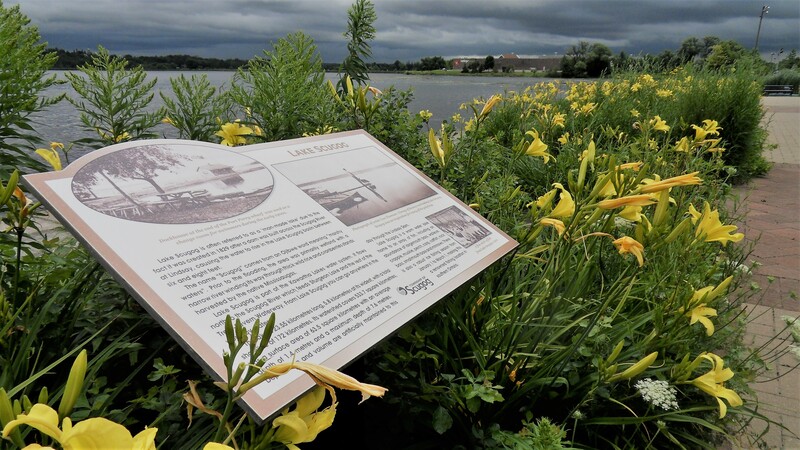 The moody inspiration for the famous Canadian landscape artist, Tom Thomson (1877-1917) part of the Group of Seven at Lake Scugog in Ontario. 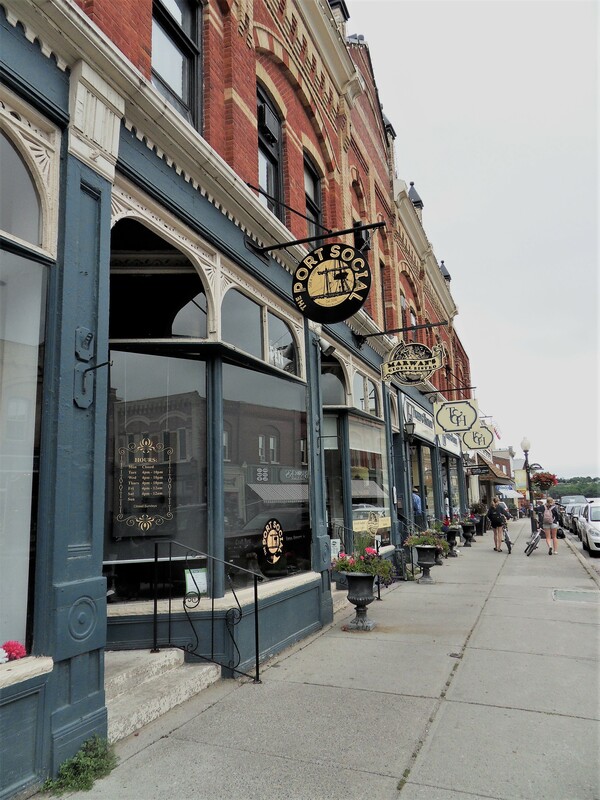 A cool shot showcasing the elegant Victorian buildings lining the main street of Port Perry in Ontario. 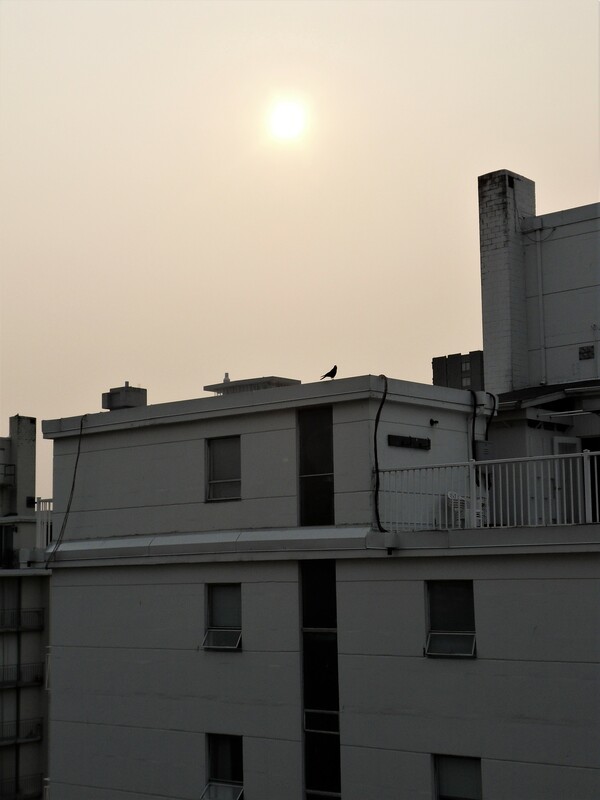 A shot of the red sun against the smoky sky (due to the fires burning up country) taken from our window here in the West End (Vancouver, B.C.). This entry was posted in blog, journaling, life, memoir, travel and tagged birthday, breathe, celebration, family, flowers, flying, food, forest fires. British Columbia, rain, stay safe, Summer, vacation, Vancouver to Toronto, wine, writing. Bookmark the permalink. And we are stars. Filled with Ki , dancing to the movement of the universe. Outside, the smoke forms a backdrop of our existence, and our breath somewhat held, twines us all to the outburn of the Interior. Holidays are memories, to be cherished. Visual images implanted in our soul, laughter and friendship, to be handled like delicate dinnerware. Brought out for the best of occasions. It seems poetic souls like to stay up late…the sun shone the brightest red yet this evening and as I look out my window I can still see smoke enveloping the mountains. It rained in Toronto today…us wishing for their weather and they for ours (minus the fires)! I loved how you subtly tied the quote to your plane trip above the clouds. I always enjoy reading people’s personal experiences; it makes me realize that there’s a whole big world out there with millions and millions of people are trying to live their lives. I said it before and I’ll say it again, you should really be a travel writer; the way you describe your experiences helps the reader feel as if they were there with you. Thanks for sharing Kimberlee. It’s always a pleasure to read your comments and know that you get me as a writer! Thank you (always!)! Love the quote and the photos! Hey, thank you so much for stopping by & commenting, I’m glad you enjoyed the post! I won a writing contest many years ago in school resulting in a trip to North Dakota to pick up “my” certificate, I wrote about the flooding of the Red River as we were living in Winnipeg, Manitoba at the time. Your wonderful words make me feel that I have come full circle…your words are “truly” a gift! karen must have been so happily surprised to have you all there like stars descending from heaven to light up her cake. Again you described so well your visit. We feel like we are there with you. over the clouds and into the blue sky . You are a real writer. Beautiful quote and photos. Thanks a million for sharing.. hugs and kisses. Just came back from Gibson. Long day. I hope you had lots of fun! Thank you so much for (always!) leaving such lovely words, I’m glad you could travel with me!! Funny that you were flying right over where I happened to be today. I was enjoying the beautiful views from Lake Superior. 😉 Sounds like you had an amazing trip. We are blessed to be able to travel and hang out in some beautiful places, we try to say “yes” to everything as my dear neighbour, Huguette and I often say!